If you're a casual Star Wars fan, you might not know that Han Solo's blaster, also known as the DL-44 is a pretty iconic movie weapon. It might not have the flash of a lightsaber, and it might not have the coolness factor of a Ghostbusters proton pack, but it's still a pretty good looking prop. 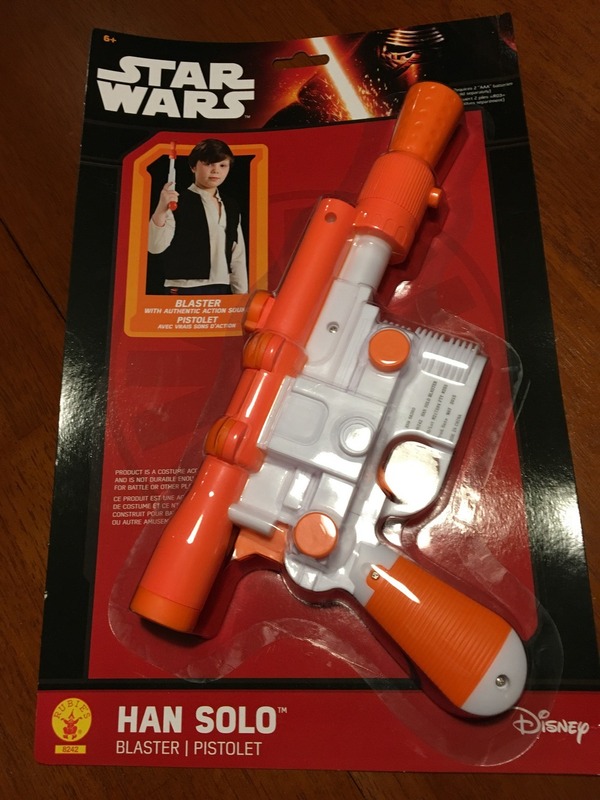 So with a little help from this tutorial on instructables.com, I decided to turn this replica toy I got on Amazon into a much better looking gun. With the gun laws in this country, having a toy that looks like an actual gun is bad news. Hence the gaudy colors you see here. Seriously, this thing looks like an orange creamsicle. I started the process with the muzzle. The original prop just had indentations where the holes were supposed to be and the barrel was covered. I used a drill and some pliers to remove that cover and a drill to make the holes in the muzzle. Next I sprayed a couple of coats of primer, then a coat of silver paint on the entire gun, then a coat of black paint on the base. The prop already looks better! My spray paint technique was unfortunately a little sloppy. You'll notice the gun sight in the upper left still has a little orange that didn't get covered. That will get fixed later. Plus I over sprayed some parts which caused the paint to drip and pool. I had to go back and sand those parts and repaint. Then I taped off the handle and painted it with brown acrylic paint. I then put a little black paint on it to dirty it up a bit. Then I started weathering the prop. It's a technique that I didn't really fully understand until now. It makes the piece look old and used and I never really got why you would want that. I want the thing I just made to look shiny and new! But I now see that weathering gives the piece a lot of character and depth. I started by using some fine sandpaper to remove some of the black paint to reveal the silver underneath. Then I used a technique I learned from watching prop maker Bill Doran's videos on YouTube. I used a silver sharpie to enhance some of the edges to make the piece look more worn. I think I did a pretty good job. What I failed at was the sanding the raised lettering off. You can still see the "CHINA" portion of the Made in China below. I also dirtied up the muzzle with some black acrylic paint. Now the gun looks like it's been fired many times. Here's a look at the other side of the prop. I failed again on the sanding on the area above the trigger, but overall I think it looks decent enough.